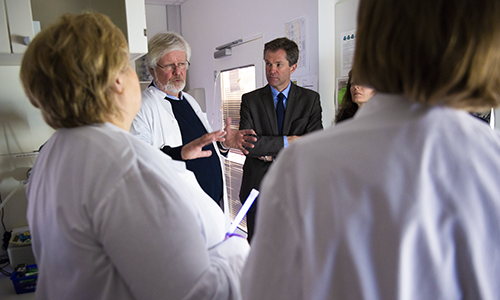 Kristian Berg, head of the "Lumiblast" project, giving prominent guests a tour of his lab (from RCN news article). The Research Council of Norway reports that Norway exceeds two per cent share of Horizon 2020 contribution for the first time. Figures from the EU show a steady increase in the number of Norwegian projects with successful proposals. “It would appear that Norwegian applicants have cracked the code and that we’re now surging ahead,” states John-Arne Røttingen, Chief Executive of the Research Council. Of the more than 10 mill Euro going to Norwegian health authorities Oslo University Hospital receive 7.9 mill Euro and Helse Bergen 1.6 mill Euro. The PRECIOUS project seeks to find out whether a pharmacological strategy to prevent these complications can reduce the risk of death or long-term disability. PRECIOUS will recruit 3800 patients in 80 hospitals to the study. Patients aged 66 years or older will be randomised to a strategy to prevent complications in the first four days of their hospitalisation, or to standard care. This simple and generally available treatment strategy has the potential to lead to an annual reduction of over 25,000 elderly Europeans being dead or dependent as a result of stroke, at very low costs. The MELGEN European Training Network (ETN) will create an environment for long-term, collaborative, inter-sectorial cancer genetics research with the ultimate aim of improving precision (personalised) medicine. In a 2012 report the European Science Foundation identified the importance of precision medicine and recommended that there should be 1) provision of comprehensive, accessible and interoperable datasets 2) improved models and decision-making processes, 3) interdisciplinary, public-private partnerships and translational research, and 4) dedicated funding including access to core technology and frameworks for education and training of professionals. The seven specific objectives of TOXI-triage address the operational; technological; ethical and societal dimensions of CBRN response and recovery, and importantly the economic base from which sustainable CBRN and multi-use systems are derived. 19 partners in 4 Task forces will deliver 9 Work Packages (WPs) that address: end user specifications; Design and delivery; Test and Validation; and, Impact. The approach defines a concept of operations that envisages accelerated delivery of situational awareness through an ensemble of embedded sensors, drones, standoff detectors (including cameras), artificial intelligence for processing sensor signals and web-traffic from social media, and centralised command and control. Neonatal hypoxic-ischemic encephalopathy (HIE) is a major cause of death or long-term disability in infants born at term in the western world, affecting about 1-4 per 1.000 life births and consequently about 5-20.000 infants per year in Europe.Hypothermic treatment became the only established therapy to improve outcome after perinatal hypoxic-ischemic insults. Despite hypothermia and neonatal intensive care, 45-50% of affected children die or suffer from long-term neurodevelopmental impairment. Additional neuroprotective interventions, beside hypothermia, are warranted to further improve their outcome. Allopurinol is a xanthine oxidase inhibitor and reduces the production of oxygen radicals and brain damage in experimental, animal, and early human studies of ischemia and reperfusion. This project aims to evaluate the efficacy and safety of allopurinol administered immediately after birth to near-term infants with HIE in addition to hypothermic treatment. Liver cancer in the paediatric population is rare with an incidence approximately 1-1.5 per million population. The commonest tumour seen in the childhood population is hepatoblastoma (HB), usually seen in young children and infants. Much rarer (about 10% of paediatric liver cancers) is hepatocellular carcinoma (HCC), usually seen in the teenage population and sometimes associated with underlying cirrhotic liver diseases. The ChiLTERN project relates to topic PHC 18 ‘establishing effectiveness of health care interventions in the paediatric population’. The ChiLTERN project builds on a unique opportunity to undertake a comprehensive research programme linked to an ambitious global partnership which will see the single largest clinical trial (the Paediatric Hepatic International Tumour Trial - PHITT) ever undertaken in this population of patients, with several randomised questions in six subgroups of patients. ChiLTERN will allow us to move towards an era of personalised therapy in which each patient will receive the correct amount of chemotherapy and will undergo has the best surgical operation (surgical resection or liver transplant). WiBEC (Wireless In-Body Environment Communications) is an Innovative Training Network for 16 young researchers, who will be recruited and trained in coordinated manner by Academia, Industry, and Medical Centres. This training will address the Social, Health, and Technology challenges of the H2020:Wireless In-Body Devices. WiBEC’s main objective is to provide high quality and innovative doctoral training to develop the wireless technologies for novel implantable devices that will contribute to the improvement in quality and efficacy of healthcare. Two devices will be used as a focus for the individual researcher’s projects; cardiovascular implants and ingestible capsules to investigate gastro intestinal problems. These devices will enable medical professionals to have timely clinical information at the point of care. The medical motivation is to increase survival rates and improvement of health outcomes with easy and fast diagnosis and treatment. The goal for homecare services is to improve quality of life and independence for patients by enabling ambient assisted living (AAL) at home. In this particular ETN, inter-sectoral and multi-discipline work is essential, as the topic requires cooperation between medical and engineering institutions and industry. Developments in medical care are driven by increasing patient care quality and reducing cost. In the field of anaesthesia, the use of regional techniques has led to improved patient outcome and reduced costs compared to general anaesthesia. However, only 60% of anaesthesiologists perform peripheral nerve block procedures regularly. A wider adoption is hindered by lack of adequate technology. Currently they are largely navigating “in the blind”, using indirect measures as well as their anatomical experience to decide where they should inject. The INTUI-VIEW solution will change this. In the INTUI-VIEW project, Philips, B.Braun and Oslo University Hospital are partnering in order to bring an ultrasound tablet solution with needle tracking technology to the market. The solution is a revolutionary and new technique. It will speed up transition from general anesthesia to regional anesthesia. Patients will receive better, first time right regional anesthesia procedures, avoiding needle misplacements. The clinicians will receive a tool allowing them to do a safer, faster job with more predictable outcome. Finally, it will help hospital and health care systems to be more efficient by avoiding to waste expensive and limited resources. Brain cancers such as glioblastoma multiforme (GBM) are practically incurable due to their location, invasiveness and highly aggressive nature. The use of light-based treatments of GBM by activating tumor-localized photosensitizers, such as in photodynamic therapy (PDT) has been clinically evaluated, but with limited success. This is mainly due to the limited penetration of light into tissue and the efficient spread of tumor cells typically up to at least 2 cm from the resection margin. Moreover, the existing photon based treatments (photodynamic therapy) are highly invasive and usually require open-cranium surgery, due to the need for external light sources. In the Lumiblast project the photons are produced inside the tumor cells in the form of chemiluminescence avoiding the major limitation of using external light to treat solid, deep-sited and inaccessible tumors. The principle utilized in Lumiblast may also be relevant for cancers of other origins. Due to its nature Lumiblast is expected to act on individual cells, rather than the collective lesion; it could thus completely eliminate the hitherto incurable GBM. Each GBM cell is expected to become a small lamp providing the light required for the photosensitive agents to become activated, killing the tumour cells from the inside. Lumiblast requires a concerted interdisciplinary action. The research in which the young scientists of the EU-GliaPhD consortium will be trained is centred on the role of neuron-glia interactions in brain function and pathology. Prompted by exciting discoveries of recent years, many academic research groups are currently focussing their research on the field of neuron-glia interactions for a better understanding of brain function. Also the private sector such as the pharmaceutical industry pays more and more attention to the role of neuroglia in various neuropathologies. These research activities create an increasing demand for outstanding young neuroscientists to join academia or industry. To address this need for neuroscientists with a strong knowledge in neuron-glia interactions, the EU-GliaPhD consortium of recognized European neuroscientists decided to initiate a training network in which young scientists, the EU-GliaPhD fellows will be educated in collaborative research projects to study neuron-glia interactions at the molecular, cellular and systems level in the healthy and the diseased brain. Primary liver cancer, which consists predominantly of hepatocellular carcinoma (HCC), is the fifth most common cancer worldwide and the third most common cause of cancer mortality. A successful surgical resection of HCC requires complete removal of the tumour while sparing as much healthy tissue as possible. Due to technical and clinical difficulties relatively low percentage of patients are eligible for resection. There is an urgent need to increase the patient eligibility and improve the survival prognosis after liver interventions. HiPerNav will train early stage researchers (biomedical engineers and medical doctors) to become international leading in key areas of expertise through a novel coordinated plan of individual research projects addressing specific bottlenecks in soft tissue navigation for improved treatment of liver cancer. The multi-disciplinary dialogue and work between clinicians and biomedical engineers is crucial to address these bottlenecks. By providing researchers with knowledge and training within specific topics from minimally invasive treatment, biomedical engineering, research methodologies, innovation and entrepreneurship, the link between academic research and industry will be strengthened. Counteracting high attrition rates in oncology drug development and providing optimal therapeutic management of cancer patients require preclinical models that properly recapitulate the complexity and diversity of human tumours. Patient-derived tumour xenografts (PDXs), established by transplanting tumour fragments into immunodeficient mice, are being widely embraced by the scientific community as preclinical tools for target and biomarker discovery. The overall goal of EDIReX is to establish a cutting-edge European infrastructure offering Trans-national Access (TA) of PDX resources to academic and industrial cancer researchers, including the distribution of cryopreserved samples to third parties, the structured biobanking of user-developed models, and the performance of efficacy studies. To ensure interoperability in services, TA initiatives will be backed by Networking Activities (NAs); these will be mainly centred around the establishment of standard procedures for PDX quality control, long-term storage and therapeutic mouse trials. NAs will also entail the adoption of shared ethics parameters for animal experimentation, the wide dissemination of services and project results, and the design of plans to ensure sustainability of the infrastructure. TENSION (efficacy and safety of ThrombEctomy iN Stroke with extended leSION and extended time window: a randomized, controlled trial) strives at providing innovative treatment to patients with severe stroke to reduce the individual and societal burden of death and dependency from stroke. To this end, TENSION is a randomized, controlled, prospective, open label, blinded endpoint (PROBE) trial of thrombectomy in stroke patients with extended ischemic stroke lesions and patients presenting in a late time window, who are currently excluded from available effective treatment approaches. The trial will enroll up to 714 subjects in eight European countries. The primary endpoint is functional outcome at 90 days post-stroke measured by the Modified Rankin Scale. The primary effectiveness endpoint analysis is a chi-square test of the difference in linear trends in ordinal mRS outcomes between treatment groups (“mRS shift analysis”). Outcome evaluation will involve a comprehensive array of clinical and safety parameters, health and socio-economic outcomes including patient reported outcome measures (PROM) for evaluation according to the principles of value-based healthcare. Improving healthcare systems mandates a shift towards personalised and preventive management of disease. Specifically, the management of cardiovascular diseases has a huge impact on European society in terms of mortality, morbidity and healthcare costs, being responsible for 1.9 million deaths in the EU annually (42% of all deaths) with a total cost of €169 billion. Advances in computational and simulation technologies now provide us with unparalleled capacity to analyse clinical data in-silico, rendering the vision of an early detection of disease through model-based diagnostic biomarkers, and the design of personalised therapies through predictive models. In-silico methodologies enable the optimization of clinical protocols, from data acquisition to device parameters and intervention choices. In-silico tools also enable the reduction of animal use in the development of novel cardiac therapies and drugs. PIC is the European ITN that will train the cohort of 15 of the future innovation leaders able to articulate and materialise the vision of a Personalised In-silico Cardiology (PIC). The EMPATHIC Research & Innovation project will research, innovate, explore and validate new paradigms and platforms, laying the foundation for future generations of Personalised Virtual Coaches to assist elderly people living independently at and around their home. Innovative multimodal face analytics, adaptive spoken dialogue systems and natural language interfaces are part of what the project will research and innovate, in order to help dependent aging persons and their carers. The project will use remote non-intrusive technologies to extract physiological markers of emotional states in real-time for online adaptive responses of the coach, and advance holistic modelling of behavioural, computational, physical and social aspects of a personalised expressive virtual coach. It will develop causal models of coach-user interactional exchanges that engage elders in emotionally believable interactions keeping off loneliness, sustaining health status, enhancing quality of life and simplifying access to future telecare services. The project will include a demonstration and validation phase with clearly-defined realistic use cases.